Every holiday, the kidlets and I make frosted, cutout sugar cookies. We all look forward to cookie night! Even Grant stops in to snag our dough. I think he does it just to make me mad. He didn't get the memo yet: No dough= NO COOKIES! After almost a year of holiday cookie baking, the kids have the process down to a fine art. We all sit around the table, and get to work! They both help me cut the cookies out. Once they are cool, Lexie helps me frost them, and Dylan decorates with sprinkles. Finally, we get to enjoy them! I think they stick with me the entire time, because they know that cookie eating is the best part! 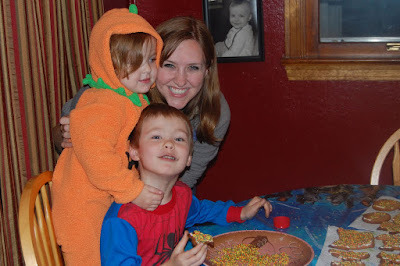 We had a good time making Halloween cookies tonight. Some parts were a bit stressful (dough stealing, ahem), but we forged ahead, and the end result was perfect. Does it really matter if there are hundreds of tiny sprinkles on my floor? These are too cute! I love that they are wearing costumes to decorate. We are doing this tomorrow! Looks yummy! how cute!! looks fun and yummy! Nope, doesn't matter, because you can tell they had fun! What a great thing to do together! How fun, we made cookies yesterday and frosted a few today. I make them just for the dough :) YUMMY. All alex and the other kids I watch want to do is eat the frosting and the dough, they could care less about making the cookies! Aw what fun! Costumes and all!